AWDI aims to secure and enhance the delivery skills of the individual, and encourage the singer on a journey to discover his/her unique voice. This module also aims to build within you a stronger internal sense of musicianship and sensitivity in expression across individual and group settings. The accompanying thematic focus on the ministry of THE SPIRIT OF YHWH calls us to abide in the power of God’s Spirit in our lives. Be a conduit of blessing to all around you as you discover the fullness of life that God desires for His covenant people. Thematic Devotion: THE SPIRIT OF YHWH. Be empowered to live lives led by the Spirit of YHWH as experienced by the Biblical patriarchs. Sing with fresh revelation as you acquire spiritual understanding from this rich source of thematic insight. Expression & Groove Management: Every singer has a distinctive tone and style that is unique. This higher module concentrates on developing an exclusive voice and expression you can call your own. With practice of a variety of songs/themes, develop greater confidence as a solo singer/worship leader. At the same time, learn how to flow and sing more effectively with musical accompaniment. Vocal Production: Maintenance exercises and vocal placement exercises. Deliver optimal performance by securing a daily vocal-kickstart regime. Flow and Direction: Understand the technicalities behind flow and direction in songs, whilst building momentum in your singing. Harmony: Harmony drills & applications to develop instinctive part-singing. Spontaneous Praise: Connect with your deepest emotions through words and spontaneous tunes. I am currently attending Worship Dynamics II of the Voice Program. My classmates and I are absolutely enjoying the lessons every single week. We record the lessons on our mobiles and diligently practice the vocal exercises and songs before the next lesson. We can feel the improvement in our singing week after week. Love the lessons! I came across the Believer Music poster on Christmas Eve at Singapore Bible Society. It spoke to me and I made a mental note to myself. Shortly after, I signed up for a Voice trial class and it wasn't a hard decision to decide on the module. During classes, I was able to connect with the inner child within me. It felt like a beam of sparkle and joy from within. At times childlike, at times worshipfully. I didn't enjoy singing at karaoke but instead, I truly enjoy singing in the classes. My voice Coach is very encouraging and I enjoy her piano accompaniment while singing the songs. Music and dance are somewhat related and I look forward to reinforce the foundations and techniques through the next two levels. And yes, I would like to sing in a choir and learn more about different aspects of music. It took me a long time to gather enough courage to sign up for singing lessons. As a very bad singer, I initially had lots of reservation and insecurities. I am indeed very blessed to have a Voice Coach who is very patient and proficient. She is very encouraging and that helps to boost my confidence. From the Primer module to Worship Dynamics I now, I feel my singing continuously improve week after week, and I constantly look forward to the lessons. Looking forward to signing up for Worship Dynamics II! I have just completed Advanced Worship Dynamics I and it was such an amazing journey. Harmonizing with my classmates is very challenging but we made it at the end of the presentation. How awesome to complete the finale! I thank our previous Voice Coach for his attention and the many tips and teachings that helped us improve our singing. It was great to have him around. Also thankfully, the new Voice Coach is awesome! My singing technique has improved tremendously with her clear and precise information to help improve.. She is able to accurately correct how I should sing properly and able to relate to the steps I need to take. 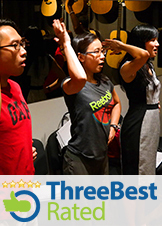 She is also very experienced, sharing with us lots of other tips to warm up our vocal cords and diaphragm. I have decided to continue to the next level with her around. I encourage all to come and learn with Believer Music for a whole new different experience! It is going to be another exciting one. The Voice Coach is truly amazing & dedicated in her coaching. She readily shares her expertise and techniques with the class without holding back. I really enjoyed her class. I had 5 questions after completing the Primer module and our Coach took the time, effort and care to answer every one of them without hesitation. Thank you, Coach! You are God’s blessed gift to the students at Believer Music! The Voice coach is an experienced instructor. She is systematic and that makes her instructions very clear. She is also patient and encouraging which makes for very non threatening and enjoyable learning. Praise God for sending her to this class! The Week 8 lesson of Advance Worship Dynamics IIII (AWDIIII) was both refreshing and enlightening as the coach zoomed in on our singing techniques. In this final module, I listened more intently and many more times to the original songs as well as the backing tracks. More so than I have ever done in my entire life! I deeply appreciate what the coach has been training us all these time, i.e. laying a good foundation upon which we can continue to learn other songs on our own. Looking back, it was relatively easy to start the journey. I would recommend Primer, Worship Dynamics I (WDI) and perhaps even Worship Dynamics II (WDII), for anyone who enjoys singing worship songs. However, I think diligence, discipline and perseverance are required to make the most of the advanced classes especially if singing is not one’s strength and passion. If you are like me, skinny and completely new to singing with diaphragmatic support, much time is also needed before the muscles grow to a point that you can feel your “power generator” when you breathe in and hold it out. It was an amazing experience when that finally happened to me towards the end of Advance Worship Dynamics III (AWDIII)! It has been a most humbling yet incredibly enriching two years going through the Believer Music Vocal Program. Praise and thank God for His grace that has carried me all the way to its completion! For an inspiring, fun-loving and gifted God-sent coach as well! I have been blessed with the best, just the right coach for this intense and quirky student. Praise and thank God for my endearing classmates who have filled these two years with much laughter, and heartwarming memories! I have gained far more than simply improvement in my singing. The lessons were a tool in Father God’s loving hands for self-discovery, building friendships, and learning from my peers. At the same time, God has also revealed the attitudes and mindsets within me that needed change. I am totally convinced that our Almighty Creator has made the best instrument within each of us. We are indeed fearfully and wonderfully made to worship Him! For eternity, all glory due to His Name! Those who have completed Advanced Worship Dynamics (discontinued module) or WDII Module. This module reinforces the foundations for delivering your voice powerfully and with intensity. Building on the foundation from WDII, there will be deeper exploration of the themes and interpretation of songs. Delivery-expression skills and worship dynamics will be reinforced through a variety of mood application, with emphasis on delivering intensity, consistency and stability. With the extended repertoire practice, you will get to dig deeper into your strengths and characteristics, and begin your journey in developing what would be your own unique voice. Expect more work on flow within songs, facilitating a richer worship experience. Group work remains a strong component, and there will be exercises to encourage instinctive and technical application of harmony singing as a class. Maintenance vocal exercises remain, so as to reinforce the technical foundation for singing. Secure a vocal kickstart regime to draw out your optimum singing voice at all times. How will these 3 months benefit me as a vocalist? - Better sense of contributing to group worship through a more accurate sense of harmony singing & its application to strengthen the message. - A certain level of intensity in expression, which will help you engage deeper in worship. - Better management of your voice through affirmation of its strengths and characteristics. - An embarkation on the journey towards discovering your unique voice. - Reinforcement of consistency and stability in your delivery, heightened sensitivity to the flow of worship when you sing.